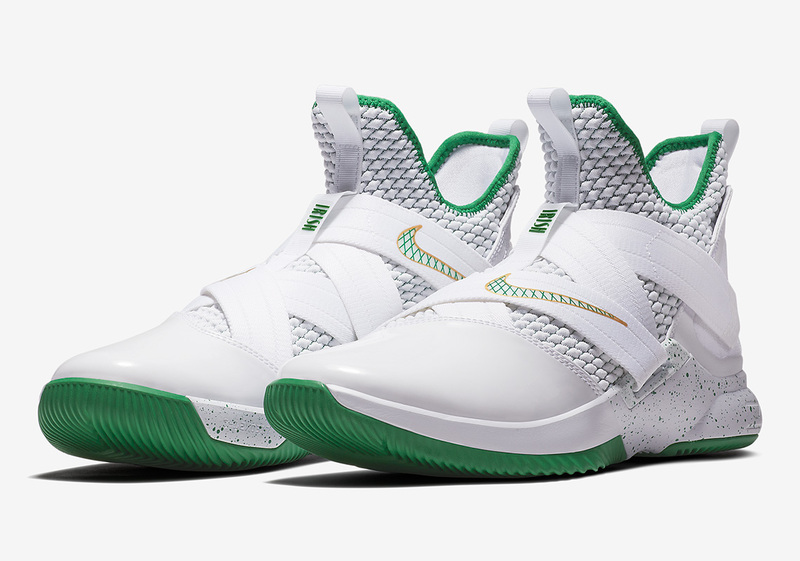 Just yesterday, we brought you an official look and updated release information regarding the Nike LeBron Soldier 12 “Dark 23”, and today we get a first look at an “SVSM” offering. Serving as a nod to the King’s St. Vincent-St. Mary high school, it comes in an Irish-appropriate home colorway. Its primarily white upper is complimented by green and gold accents on its branding, speckled midsole, and outsole. LeBron’s signature Dunk Man logo appears in a unique way, as it is subtly featured on the velcro area that helps the wearer control his or her lockdown fit. Finally, an Irish logo on the insole finishes off this honorary look to put the SVSM tribute over the top. Pairs are expected to arrive at Nike Basketball retailers on May 5th with and MSRP of $130 USD.